Several decades ago, it seemed almost sure that in the year 2020 we would’ve lived in cities with flying cars. Sadly, the reality is that we are not as close to this truth as futurists predicted. That said, we can almost certainly predict that flying cars will happen in the near future. Boeing’s subsidiary Aurora Flight Sciences already works on one, and it just made its first successful test flight. Boeing’s flying car is fully autonomous, and it takes cues from drones for the design and propulsion. Perhaps drones are not how we envisioned flying cars, but it’s the only tech available right now that allows for easy vertical takeoff and landing in congested cities. As expected, electricity is used for propulsion, which makes it an EVTOL aircraft (electric vertical takeoff and landing). 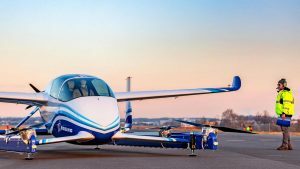 With the built-in batteries, Boeing’s vehicle can travel up to 50-miles with one charge and is 30-foot (9.15 meters) long and 28-foot (8.5 meters) wide. But, what we want to know is when we will see aircraft like this in the skies, and the answer might be soon. Aurora Flight Sciences already partners with Uber on the same matter, with the latter already announcing that their autonomous flying taxi is on track and should be soon part of the Uber Air network. According to Uber, the first cities to have flying taxies will be Dallas-Fort and Los Angeles, with 2023 predicted as the year when that would happen.